Lane Agility Speed: 12.3 sec. Antelope Valley College has been watching Osi for a number of years. However he decided he would give a Prep School, DME Academy, in Daytona Beach, Florida a try when graduated. Leading his team in 19 games at DME, he had PPG = 28.6, RPG = 8.6, APG 3.0. AVC received a phone call from Nwackukwau this spring and Osi had decided that he wanted to play basketball for Antelope Valley College. 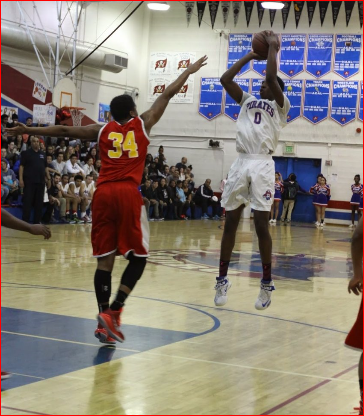 Osi’s goal is to get his AA at AVC and his University degree at a D-1 university. After that, his goal to play professional basketball that the highest level possible. Versatility is what Osi brings to AVC with his strength, scoring, ball handling and rebounding in any of three positions as the need arises. Welcome Osi. Osinachi “Osi” Nwackukwau, 6’4″, 190, freshman, who the coaching staff are finding some unexpected skills sets, especially ball handling and floor vision. A 6’4” point guard with 6’8” wing span? A Wing with PG skills and potential to pull down 6 rebounds per game? Great basketball team personality. Osi’s conditioning has improved impressively and it has improved the freshmen’s game on both end of the court. A player to watch. The university coaches are.